This clothing store has been completely renovated to meet the needs of the client and to give the exhibition spaces a modern and elegant look. To give greater importance to the entrance area, it was decided to move the cash desk from the center of the store to the side part of the entrance and to create an area specially designed with the counter and an office. It was sought a better arrangement for clothes and accessories to meet the needs of the client to better distinguish the product areas for women, men, ceremony, jeans, reusing the racks along the walls and the existing lighting system. The products on focus are highlighted by some asymmetric frames made of lacquered wood, specially designed by the architects as a backdrop to the clothes to put on display. For the stairs area it was chosen to use an elegant damask wallpaper with golden details to emphasize the display of accessories. 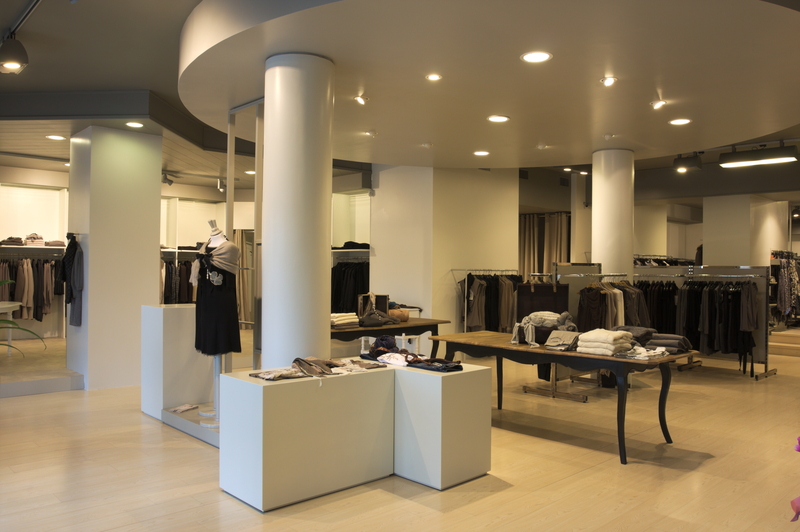 The use of neutral colors on the shades of warm grays for all the areas gives to the store a refined and welcoming look.